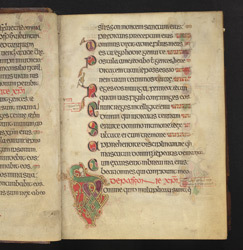 This psalter was made in Ireland (Armagh? ), probably in the late 12th century to judge from the style of the script. The scribe signed his name on one of its pages: 'Cormacus wrote this psalter: pray for him'. Its decoration shares some features of manuscripts from Armagh, but it combines stylistic elements seen in 8th- and 9th-century illumination (in masterpieces such as the Book of Kells) with current styles. Containing canticles or verse passages from the Bible, such as Deut. 32:1-43, as well as the Book of Psalms, it was used as a prayerbook or hymnal in church services. The last verses of Psalm 2 and the beginning of Psalm 3 are written on this page. Psalm 3 is entitled, in red, 'About the Passion of Christ,' which cannot be a literal title but is rather an allegorical one. Several types of Psalm titles were available in the Middle Ages, some more literal, others more allegorical. At the start of the psalm, a magnificent segmented serpent twists into a complex shape, the top of which forms the letter 'd' of 'Domine' ('O Lord'). In the margins are two devotional and liturgical notes, one pointed to by the 'toe' of an animal which sprouts from a letter.